Can the Mannings go meat-free? In case you hadn’t noticed, meat plays quite a large part in our diet in the Manning household. It won’t have escaped your attention that Mr M orders a steak pretty much any time we go out on a blog unless I bully him into having something different, which will probably end up being meat of some description. He’s not the only one – I’m a bit of a carnivore myself and love a good steak or a tasty bit of lamb. Since I’m endlessly trying to balance my diet a bit, I do tend to opt for chicken or fish, especially if I’m on my own. But to have a meal that consists only of vegetables is pretty alien to both of us. 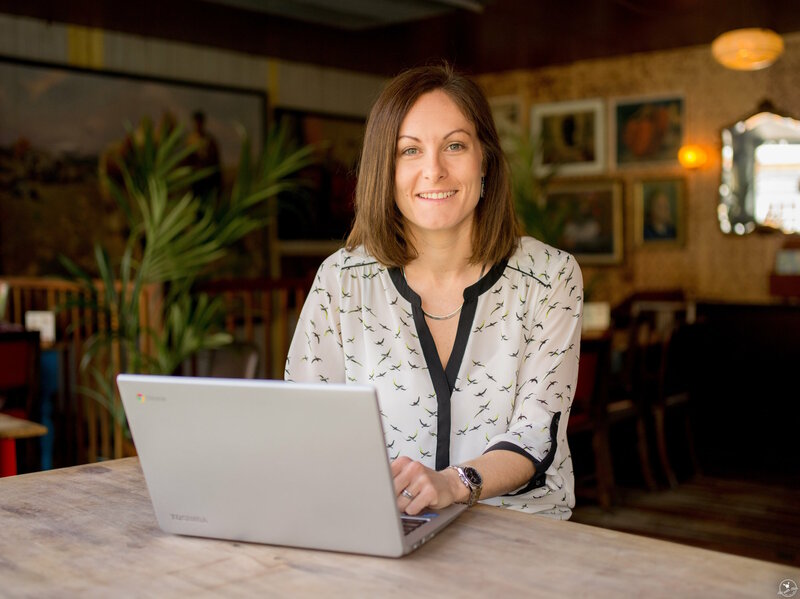 That’s why, when I was asked if I wanted to try out some products that make vegetables the star of the show, I was intrigued – albeit slightly daunted. Goodlife is all about the veg. The products are frozen (nice and easy then), but they claim to be passionate about finding the most amazing vegetables from some of the country’s most dedicated farmers then turn them into tasty veggie meals. It’s not a bad thing to be aiming for these days. While I selfishly love eating meat, there is plenty being written about how our huge consumption of meat is perhaps not brilliant for our diets, but can also affect the environment and is fairly unsustainable. I actually do LOVE vegetables – I’m just in the habit of not thinking of them as the main event of a dish, more the supporting roles. So perhaps I’m one of those who needs people like Goodlife to remind us that veggies can, indeed, be the leading players on the plate. The veggie aisle isn’t somewhere I’d usually look in the supermarket, but I went off hunting and found a pretty tempting range of stuff from these guys. 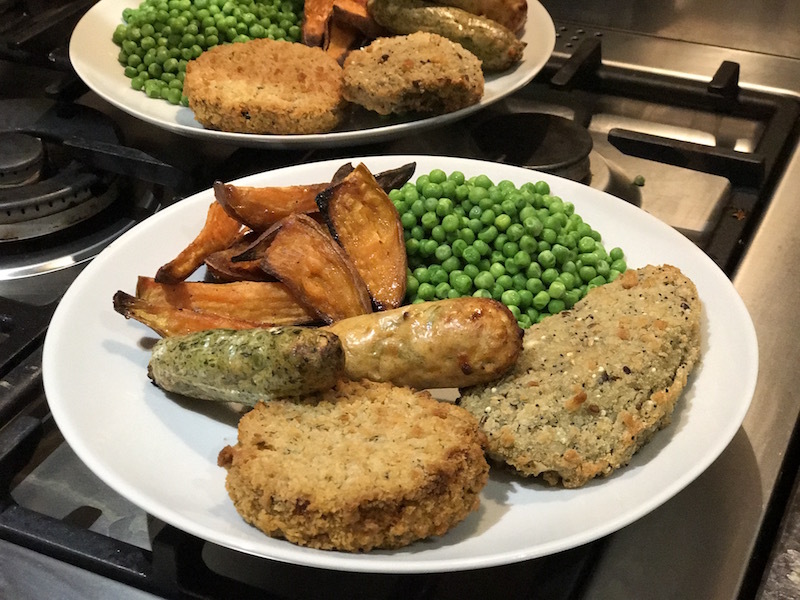 I looked in Waitrose (not because that’s where I usually shop, just because it happened to be near where I was working that day) and found this lot – spicy beanburgers, mushroom and spinach kievs, and two different kinds of sausages. 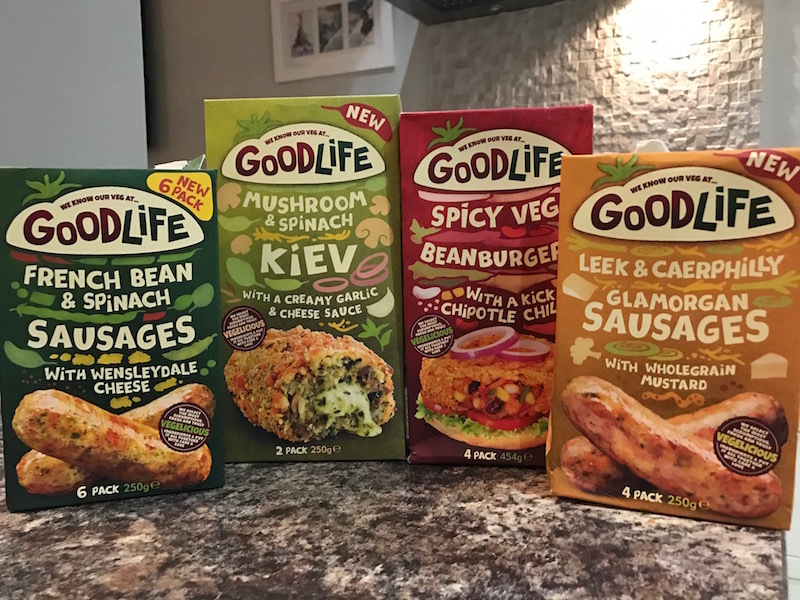 I’m told Goodlife have just started being stocked in Iceland Warehouses and as well as the kievs and French Bean and Spinach Sausages, you’ll be able to find Falafel with Chickpea, Cumin & Coriander, which are still on my list to try. In a bid to stop Mr M from going on strike over the lack of meat on our plates, we decided to have a veggie feast and basically cook everything. Slightly excessive, I know, but would you expect anything less from us? 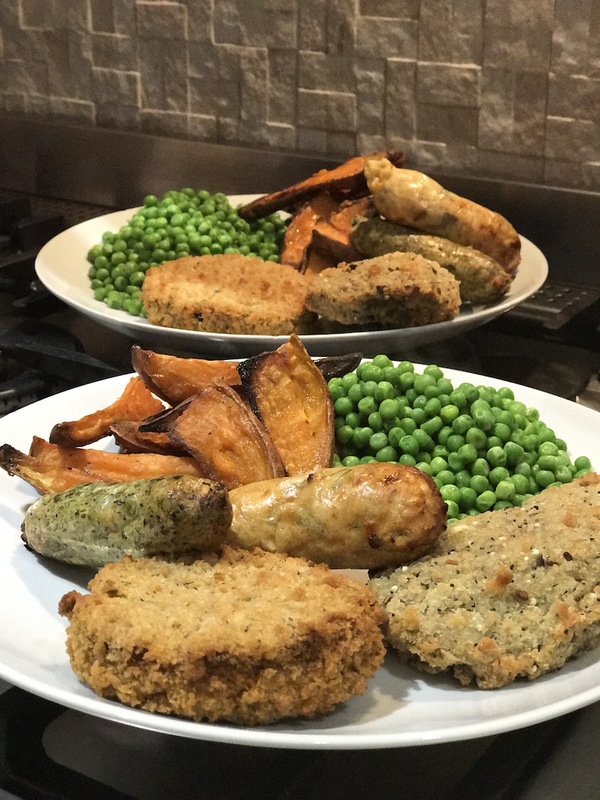 To that end, we (I say we, he did it really) set about assembling a banquet of kiev, beanburger, and one of each kind of sausage, served up with some homemade sweet potato wedges and peas. I’ve got to say, I felt pretty virtuous with a plate full of veg. Apparently Goodlife only use natural ingredients, so although you’re basically making a ‘freezer dinner’ it feels quite good knowing it’s not processed rubbish. 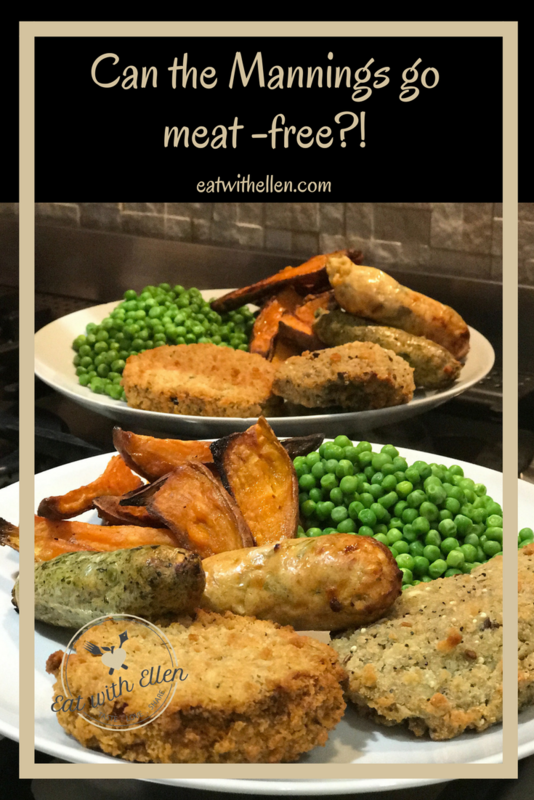 I was slightly concerned that the veggie food might have made for a bit of a beige plate, but actually served up with the sunny sweet potatoes and gloriously green peas, it looked a lot more appealing than I’d thought. I was gagging to try the sausages and thought they’d be my fave – and taste-wise they were pretty darn good. You have to get used to the texture being slightly different. Of course, leek and Caerphilly cheese or French bean and spinach are never going to share the same meaty bite that normal sausages do. But I actually think that’s a good thing. I’ve never really understood why people would decide not to eat meat, then spend their lives eating meat imitations – you know ‘bacon’ that’s not real bacon, or sausages that pretend to be meat but are made of some processed equivalent. These are proudly packed with the taste and texture of veg and cheese and while perhaps an acquired taste, there’s a kind of honesty about them that I quite respect. The beanburgers were a winner for me – spicy and substantial, they’d be great in a bun with a load of salsa and mayo on top and some crunchy lettuce leaves. I’ve already got the remaining ones reserved for me for a night when Mr M is at work. He, on the other hand, voted for the kievs as his fave. I think it’s most likely because of the gooey cheese inside that spills out when you find it. A nice variation on the classic chicken kiev that I know he’s quite partial too as well. Of course, you could say that there was a slightly element of overkill in our massive vegetarian feast but hey, we don’t do things by half. It was a good way of trying everything in one go, and we’ve got plenty left to eat them in other meals. I’m definitely planning a burger night, and I’m thinking that the sausages would be nice cut up and mixed in with a some lentils or pulses for a healthy, balanced lunch. There also seem to be a few more to try, from Picador Parsnip & Sweet Carrot Nut Burgers to Beetroot and Feta sasuages, plus I do want to get my hands on that falafel. I’ll say this right now – if you’re looking for something that either tastes like, or feels like, meat while you’re eating it, you won’t like these. They are vegetable through-and-through and the bangers won’t con you into thinking you’re eating a pork sausage, neither will the burgers kid you into believing they’re beef. But that’s not really the point. This stuff is about celebrating veg and showing how it can be eaten in different ways, combined with all sorts of different flavours, and made into something that can be the main event on your plate, not just a bit part in the overall performance. Combine that with the ease of bunging something in the oven straight from the freezer and the fact that it probably doesn’t do any of us any harm to steer clear of meat once in a while, and you’ve got yourself a nice easy alternative. Definitely not something that I’d object to having once a week. Try it, I dare you. If we can go meat-free, I’m pretty sure anyone can. This is a sponsored post commissioned by Goodlife, so I was paid for my time and efforts. But I bought the food, cooked it (well, Jamie did), ate it, and wrote this all myself.